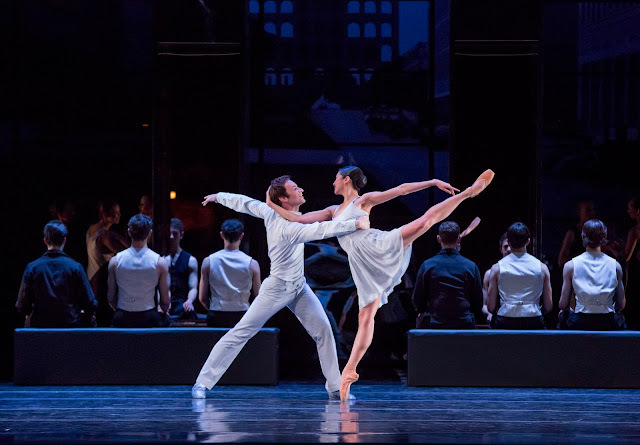 How much fiddling can a stalwart ballet like Romeo & Juliet take? Turns out, quite a bit. 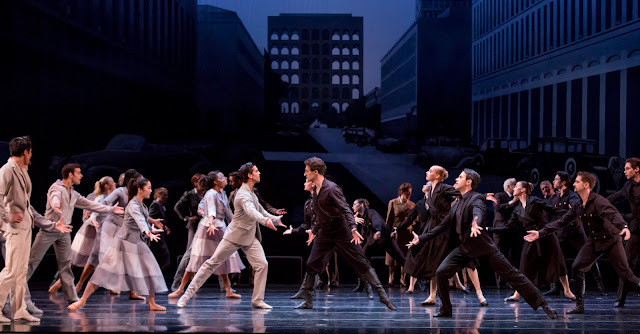 In Krzysztof Pastor’s 2008 production, presented by the Joyce Foundation at the Koch Theater recently, the action takes place in three eras over the last century to underscore how history repeats itself. It’s an intriguing premise that mostly succeeds, supported by the designs by Tatyana Van Walsum and the sturdy Prokofiev score. Pastor’s style of ballet tends toward expressionistic, with clean lines, twisting torsos, and limbs pulling in opposition. It’s most effective in the meaty group scenes featuring warring factions or ballroom dances. The character of Romeo (Alberto Velazquez) felt slightly undersketched; he came across as callow, rather than a soul-sick poet. Juliet (Amanda Assucena) was portrayed as bold and stronger than the traditional character of a child-woman. The role of Paris is greatly diminished in this version; at one point several men have a sort of speed dating meet-up with Juliet, who winds up with one, but it's more a metaphor of the dominance of the authoritarian ruling party than individual choice. For the balcony duet, Juliet is cleverly suspended above the stage in a small elevator, which lowers her to the ground to dance with Romeo. The level of technique is honed, with dynamic performances given by Derrick Agnoletti (Mercutio) and Edson Barbosa (Tybalt). The overall metaphor of the effects of war is at times depicted as taking place between authoritarian figures—the ruling family and attendant police—and the people, as in the 1930s setting. In the first act, the differing dark vs. light costumes clearly distinguish the factions until the ball, where everyone wears black and white except the lead couple. They wear pale blue in every act; Juliet a camisole dress with a short skirt; Romeo a jacket over shirt and pants, reminiscent of terrible prom tuxes. In the final act, Juliet wears lingerie—an ill-fitting camisole and shorts, and Romeo cheap-looking shirtsleeves. The costumes undermined the stage power of the romantic couple, to a distracting extent. In the act set in the 1950s, the palette becomes red and black, the background imagery full of Vespas. A window colonnade separates the inside from outside; people pass by the windows as fleeting shadows. The scene in the 1990s is set in Juliet’s room, now a sleek apartment building. Clever sculptural panels descend and rise to give texture to the austere basic set. Unfortunately, by lying in front of her, Romeo obscured Juliet from view in the death scene, which could be prevented. And after the first action-filled scenes, the finale dragged in pace. But overall, it was heartening to see that the Joffrey has flourished after departing New York for Chicago decades ago. Anna Chirescu and Gianni Joseph in Place. Photo by Charlotte Audreau. The company recently brought to the Joyce three works of great variety. Inlets 2 (1983) is time-stamped by its pastel leotards of milliskin, very shiny lycra, designed by Mark Lancaster, who also lit it. The John Cage composition Inlets was played on sea shells, some giant conches, with water, making trickling and burbling sounds. The movement is one of Merce’s nature studies, mostly unhurried, or with quickened paces ebbing and flowing. Small groups move together and break apart amid the ice-hued lighting schemes. Legs cross and bend, like birds, but these organic postures are mixed in with the geometry of ballet. Place (1966) is far more dramatic. Gianni Joseph slowly, muscularly, strides centerstage into a pool of yellow light (Beverly Emmons, who also designed costumes and the wooden palette decor) and drops to a pinwheel. Several women wearing tinted plastic tunics join him, spinning rapidly and rocking in second position relévé, and then a few men wearing plain brown. Later, dancers enter one by one, fabricating a modulating tableau. Joseph slides two multi-sided lit orbs upstage, perhaps a kind of time tracker. A man carries a woman wound, front side out, around his torso like an expressive sculpture; she then lies face down, suspended on his thighs. 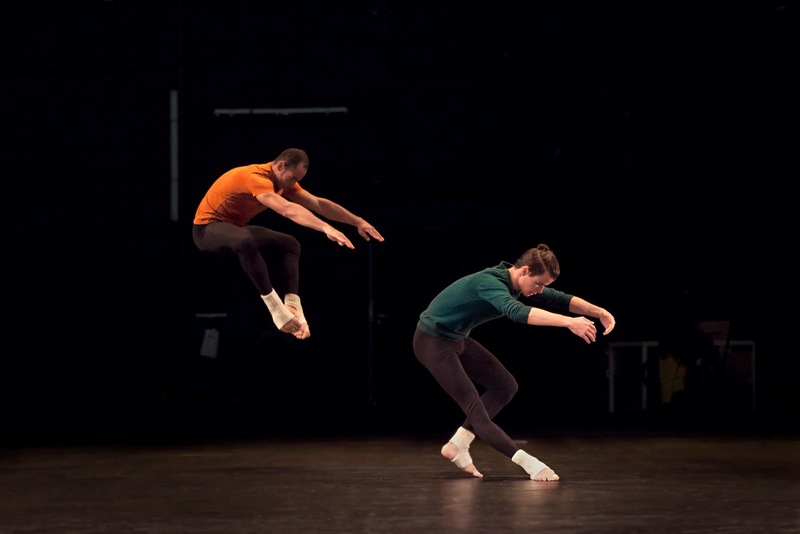 There’s more lifting than in your average Cunningham dance—cruciforms, splits, and more. Joseph digs out a translucent plastic sack and, legs inside it, struggles across the stage. For How to Kick, Pass, Fall and Run, two readers sit at a table, stage left, reciting short anecdotes about random topics. The dancers wear black tights, white stirrups, and bright tops. In this athletic dance, they bound, jump in x-shapes, twist, and leap full-out. Standing legs bent, they crisply développé the other leg to the side and front. The viewer’s attention is torn between understanding the speakers’ stories, and giving full regard to the movement. No doubt John Cage (who provided the text, Stories from Indeterminacy) was smiling as one of the spotlights in an upstage string of them blew, sparks showering onto the stage before those fixtures were turned off. Truly, anything can happen in live performance.